Lively Tirana wears its history with pride. It would be easy to mistake Albania’s colourful capital for any modern city in Western Europe – with stilettoed professionals crossing its wide main boulevard to meet for macchiatos in chic cafes. But then you come across an Ottoman-era stone bridge, an Italian villa, and a concrete apartment block with fresh pastel paint… and you realise there’s more here than meets the eye. With 45 years of isolationist communist rule in the rearview mirror,Tirana has undergone a magnificent transformation in recent years and is on the rise as an offbeat destination for travellers. Many pass through the city on their way to Albania’s towering mountains and pristine beaches, but don’t count Tirana out – there’s plenty to discover over two days in this charming town. Begin your day with a bird’s-eye view of the city as you sip an espresso from the rooftop restaurant of the newly revamped Xheko Imperial Hotel. Properly caffeinated, you’re ready to start your exploration in nearby Mother Teresa Square, which hosts a modest statue of the famed ethnic Albanian missionary. 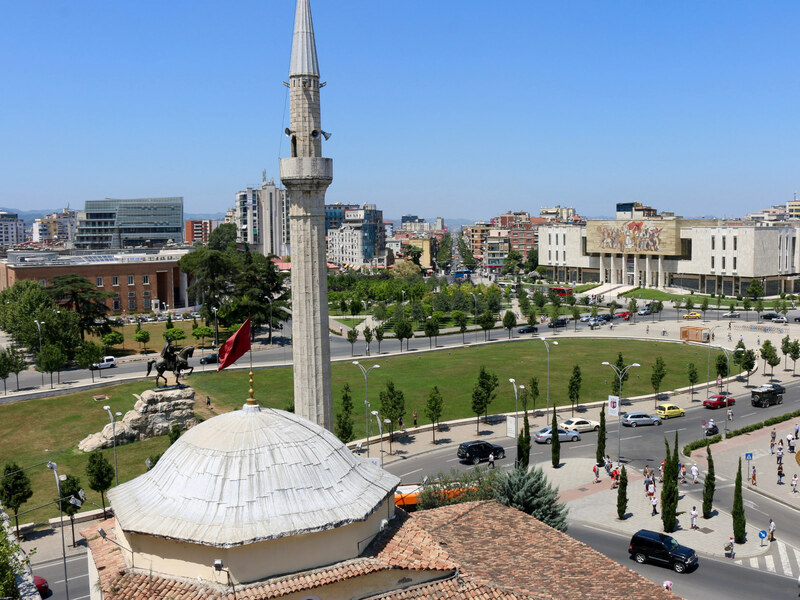 Heading north from the square – renovated for the 2014 visit of Pope Francis – continue your stroll down the impressive Bulevardi Dëshmorët e Kombit to the National Art Gallery. You can’t miss the striking Cloud pavilion out front, which was designed by Japanese architect Sou Fujimoto and doubles as a piece of art and a venue for cultural events. If history is more your thing, follow the boulevard to the National History Museum, immediately recognisable by the powerful mosaic mural to Albanian pride adorning its facade. You can also pick up the 10am daily free walking tour (tiranafreetour.com) of the city on the museum steps. With much still to see, refuel with a flaky spinach pie (lakror në saç me spinaq) at nearby Oda. Designed in the style of the 18th-century meeting room for which it’s named, the restaurant – while slightly touristy – is a perfect introduction to Albanian cuisine. If you opted for museums in the morning, spend the afternoon on a self-guided tour of the city’s sights, many of which have posted signs with QR codes. On your way back toward Skanderbeg Square, stop at the 19th-century Clock Tower, which was renovated and unveiled as a symbol of Tirana’s march forward by Mayor Erion Veliaj upon taking office in 2015. Climb to the top for the best view over the minaret of neighbouring Et’hem Bey Mosque to the statue of Albanian national hero Skanderbeg and the futuristic Resurrection of Christ Orthodox Cathedral in the distance to the left. Afterwards, take a walk through the centuries from the Byzantine Fortress of Justinian to the 19th-century Tanner’s Bridge, and the Pyramid, formerly a museum to longtime communist dictator Enver Hoxha. To get a sneak peak into life under Hoxha, pop into quirky ‘cafe-museum’ Komiteti for a coffee (or one of 25 varieties of raki, the local fruit-based liquor) along your journey. After a full day of sightseeing, reward yourself with an Aperol Spritz in the hip garden of Tirana mainstay Pepper Lounge. Just around the corner, you can feast on handmade truffle rigatoni at Salt (facebook.com/salt.tirana), a worthy newcomer that’s upping the ante for the city’s well-established Italian dining options. Complete the Italian hat trick by stopping into Cioccolatitaliani for some truly innovative gelato creations. Fortified, spend the rest of the evening indulging in Tirana’s ever-evolving art scene. Non-profit Tirana Ekspres and the newer Tulla Center each host a rotating series of exhibitions, concerts and other cultural events that offer insight into modern Tirana. Believe it or not, Tirana is home to the Balkans’ best bagels. Pick up one for breakfast from the aptly named New York Tirana Bagels (newyorktiranabagels.com), a cafe and social enterprise whose profits go towards supporting people in need. From there, take a 20-minute taxi ride (900 lek, or around 6 euros) to one of Albania’s most fascinating attractions: BUNK’ART (bunkart.al). This museum and art exhibition, which opened in 2014, is part of a wave of recent efforts by the Albanian government to lift the curtain on its Cold War past (along with former secret police headquarters, the House of Leaves, due to open as a museum by the end of 2016). Dedicate a couple of hours to exploring the 40 rooms of this eerie five-storey bunker, built in the 1970s for Albania’s political and military elite as part of a massive project to construct up to 700,000 bunkers across the country. Upon leaving BUNK’ART, turn right and make the 10-minute walk uphill to catch the Dajti Express. Opened in 2005, the Austrian-built cable car provides a breathtaking 15-minute journey to the top of Mt Dajti, with views along the way of scenic forests, farmland, and – yes – bunkers. The 33-sq-km national park offers outdoor activities to suit all interests: from hiking to target shooting, horseback riding and mountain biking. For a pre-hike lunch, you can walk or take the available shuttles to any of the local restaurants that specialise in roast lamb on a spit. Panorama (panoramadajt.al) and Gurra e Perrise (facebook.com/pages/Gurra-e-Perise-Dajt) are local favourites. If your time is limited, Ballkoni Dajtit (ballkonidajtit.com) at the top of the cable car offers an impressive selection of wine, as well as international and Albanian fare – all with panoramic views of Tirana. Your last night in Tirana should take you to the trendy Blloku neighborhood, once restricted to only high-level communist party members and now home to the city’s best nightlife. Spend the evening hopping between Tirana’s many famed bars: get a full aperitivo spread at wine bar Bufe (facebook.com/BUFE), peruse the retro decor and hipster crowd at Radio, and pop into Colonial Cafe (facebook.com/pages/Colonial-Cafe) or Nouvelle Vague for some of the city’s most creative cocktails. Make sure to grab a bite along the way at Otium (facebook.com/Otium-Restaurant), where the menu changes daily to highlight the freshest local ingredients available. When Blloku starts to wind down around midnight, during the summer months you can make your way over toFolie, where the party rages until the wee hours of the morning.